The Bicycle Boulevard is planned to start at the northeast part of the Gateway Community College campus. One entry point is the Grand Canal at 40th Street and Van Buren. The nearest Light Rail stops are 38th St. and Washington and 44th Street and Washington. Once you get on the Grand Canal, proceed northwest. A foot bridge will be built to get from the canal to Roosevelt Street. The path then heads west on Roosevelt all the way to 19th St, then south on 19th Street to either McKinley or Fillmore. There are three choices of where the Bike Boulevard can go in the Garfield neighborhood and through Downtown, one is straight west on McKinley, another is Pierce (at 14th Street) and the third option is Fillmore. Currently, the McKinley route gained most traction at the last Bike Boulevard meeting. Any of these three routes would take the biker west to 11th Avenue and cross the pedestrian bridge over I-10 and then west to 15thAvenue. Going north on 15th Ave will take you to Encanto Park, Phoenix College, Christown Mall and the Arizona Canal just north of Dunlap Ave. A foot bridge is planned for the Arizona Canal as well. 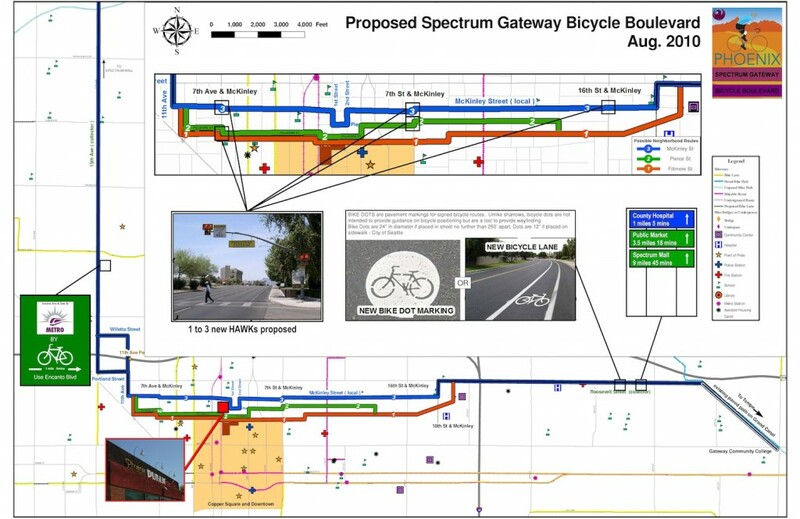 Essentially, the bike boulevard would be connecting Gateway Community College to Downtown, to northwest Phoenix. The Light Rail stop at Gateway connects Tempe and part of Mesa to the bike boulevard as well, extending the reach even further. Plus, let’s not forget that the bike boulevard will also serve those who ride to Sky Harbor Airport, like the employees. The bicycle boulevard would consist of new bicycle lanes, take advantage of existing bicycle lanes, and where bicycle lanes can’t go in, there will be 24” bike dot markings every 250’ or less. Bike dots will go on local (neighborhood) streets where there is no room for bicycle lanes. Depending on which of the three Downtown routes is chosen, there will be 1 to 3 special pedestrian or bicyclist activated signals known as HAWKS (High-intensity Activated crosswalks) added at busy road crossings. Since this project is relatively inexpensive to implement, funding for the bicycle boulevard will likely come from the normal capital improvement program or CIP. The bicycle boulevard is projected to be in place by early 2011. Posted on November 11, 2010, in Downtown Vitality, Sustainability and tagged Bicycle Boulevard, bicycles, Cycling, Gateway Community College. Bookmark the permalink. Leave a comment.